Visualization for Jazz Improvisation is a great starting place because you’ll learn how to think like a professional jazz musician, instead of being a slave to chords and scales. You see, professional jazz musicians have all this information so ingrained, that they don’t need to expend any mental effort to access chords, chord-tones, scales, progressions, or even substitutions. But, mental information is incomplete without an aural component. 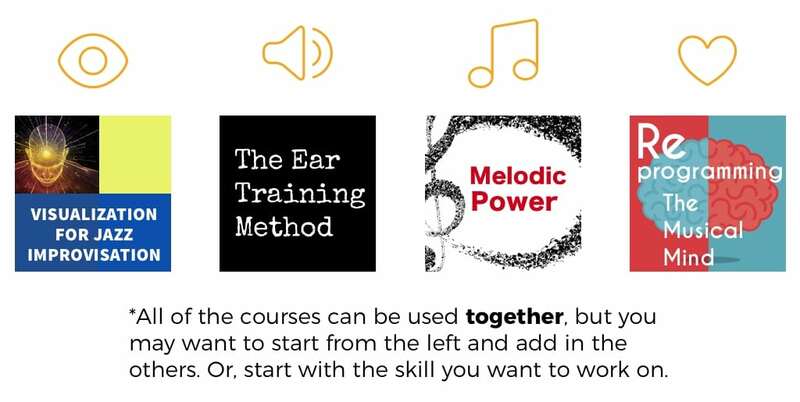 Enter The Ear Training Method. This course is a great compliment to the Visualization course because you’ll start to form an idea of how everything sounds. You can put this course material onto your phone and listen to the ear training tracks as you commute and go about your day. Those two courses will give you a solid mental and aural foundation to work from, but you still need some examples about how to actually play over chord changes, and this is where Melodic Power comes in. As you probably know, the best way to learn how to play jazz is to learn it straight from the recordings. People will always tell you to transcribe, but what they don’t tell you is there are some key ways to how you interpret the content of what you’re transcribing. In 42 lessons and over 5 hours of video demos, Melodic Power not only gives you tons of melodic techniques over all the essential chords, it teaches you the process of creating your own melodic techniques. This process is the missing link between transcribing and actually using the information in your solos. Now, without a doubt, there comes a time in every musician’s life where they feel really nervous when they perform, burnt out with music, or really down about their playing. All of these negative thoughts don’t help and if you’re experiencing any of these kinds of things, then the Reprogramming The Musical Mind Course will get you back on track. It’s a straightforward 30 day audio course that you can use time and time again, to train your brain in a way that will help you reach your most creative state. So there you have it! All of the courses compliment each other and you can start with Visualization and add on the other components from there, or just start with the fundamental skill that you think needs the most work. With a concerted effort on any or all of these courses, you will set the foundation for your lifetime study of jazz improvisation.